The Index opened positive above 8600 and stayed in a narrow range for the better part of morning session only to see huge up move in the second half to scale 8650 and closed near the highs at 8659.90, huge gain of 73.65 points. The broader market was also very positive, with 1071 advances to 453 declines. Developing Range as per Option Table comes 8400-9000. Call option 8700-9100 added 16.37 lacs OI with short covering seen at 8600 and below strike prices. Put option 8700-8200 added huge 16.67 lacs OI with small short covering seen at 9000 and above strike prices. 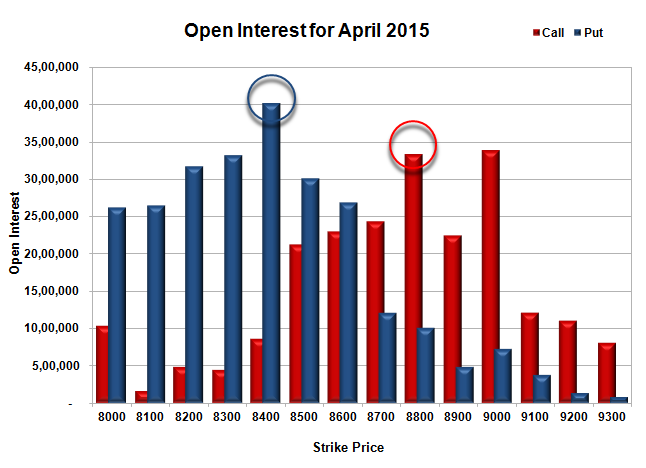 Nifty Open Interest is at 1,86,03,375 down by 3,70,150, with increase in price, most probably huge short covering. 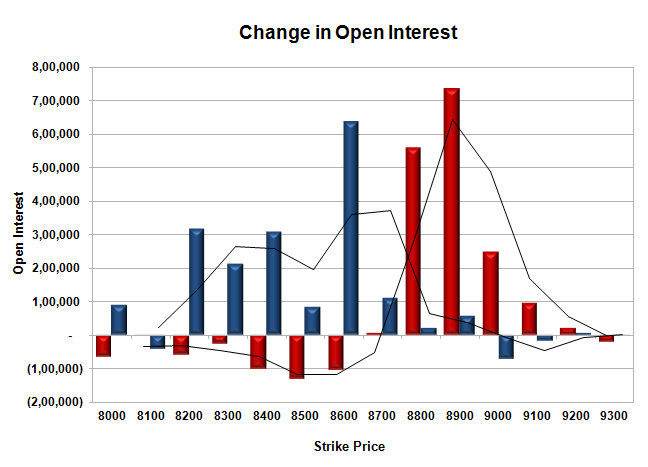 Bank Nifty Open Interest is at 17,72,925 down by 69,800, with increase in price, most probably short covering. FII’s sold huge 7.19 lacs Futures, which includes 18149 contracts long liquidation and 10630 contracts short build-up, with decrease in net OI by 7519 contracts (includes 27222 longs to 56001 shorts for the day) and the Average Price comes to 8756.37. FII’s Index future open contract as on date is 500665 Longs to 144034 Shorts, net long 356631 down by 28779 contracts. Initial support at 8600, with OI of 26.90 lacs and below that at 8500 with huge OI of 30.16 lacs. Initial resistance at 8700, with OI of 24.38 lacs and above that at 8800 with OI of 33.38 lacs. 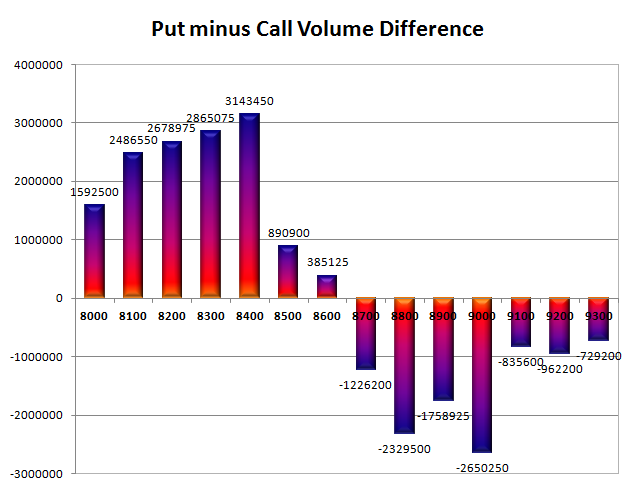 Day Range as per Option Table is 8553 - 8727 and as per VIX is 8594 - 8726 with 8634 as the Pivot.